>i’ve been inexplicably obsessed with handspun yarns lately. 1. they’re simply beautiful. colour explosions, clever combinations, and interesting textures. how can you not drool? 2. kara janx’s hats in her project runway collection. so cute, right? she mentions in an interview that she got ‘help’ with the handspun handknit hats from purlsoho and suss. all paths lead to the ozark yarn which kara most likely used. yay. thank you, kara, for putting a stellar fashion-forward shoutout to the craftypeeps. plus, your collection rocked! 3. the knowledge that a human has put great care into the work. comparing handspun to say, stuff you get at the local art supply store, is like comparing an original and inspiring oil + canvas painting to… a thomas kinkaid print at walmart. in a cheap frame. and faded. 1. the sheer energy and time it takes for a spinner to make high-quality yarn (all factors from fiber to dye to spinning to selling) makes things super expensive. 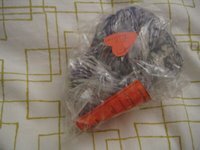 i have seen yarn that is 50 yards for $40. 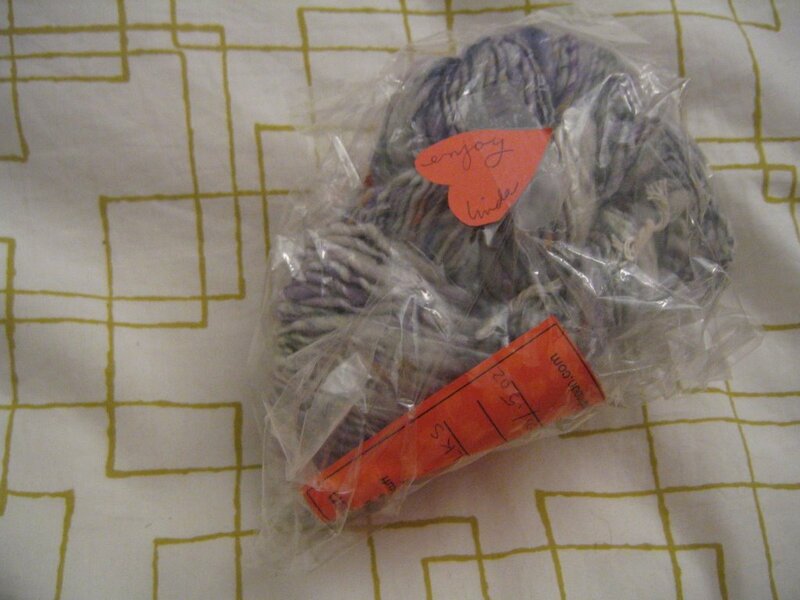 small skeins can go even to $60. it’s scary. 2. i adore the thick-thin, organic look of the yarns. however, it’s sometimes confusing on what needle size to use. 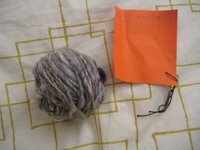 you’re either on tiny needles when a big lump of roving comes your way, or feel silly working the teeny plies on too-large needles. what’s the secret? using the largest needle size necessary? or just relax and let it just ‘become’? 3. i wish there were patterns out there tailored specifically for handspun yarn, something to let the best qualities shine. 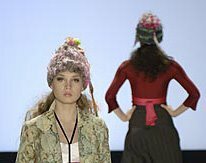 maybe i havent been looking hard enough but all i can really see out there are drop-stitch scarves (you can only work that for so long) and funky hats. 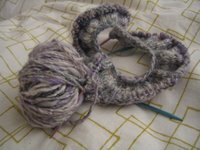 are there some interesting and unique felting or hand-knotting techniques? or just more pattern selection? 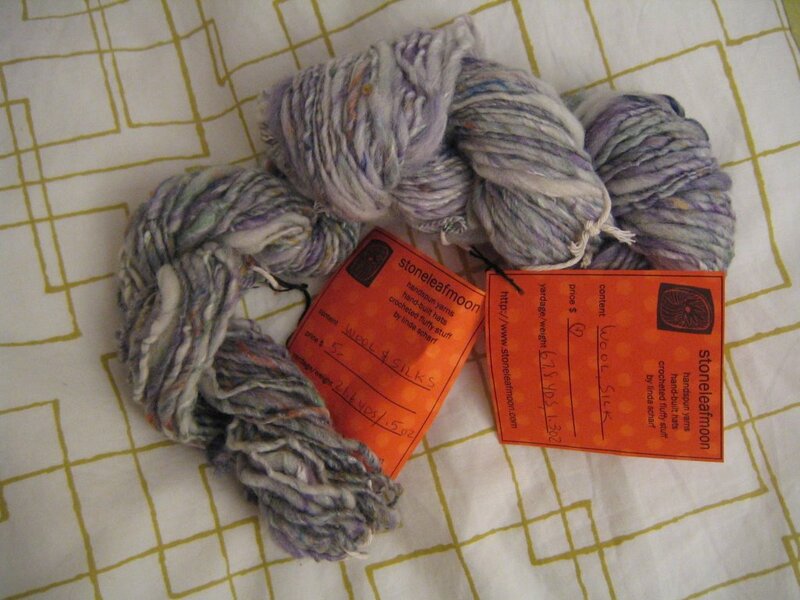 anyway, i did realise i had some handspun in my (small, i swear) stash, from linda of stoneleafmoon yarns. she makes some crazy, amazing stuff. i bought the tiny 21 yd skein for $5 at the summer market in union square last summer, and she was incredible to send me an additional 62 yds of the ‘kitty’ colourway gratis. that’s no small freebie! thank you linda! so i’ve always wondered how best to use this gorgeous yarn. (digression: this colourway from midnightskyfibers looks süpersimilar.) i finally came up with a brilliant project that will suit the yarn perfectly. >i have the same question about the thick/thin yarns. i’m working with davos right now and i can’t say that i really like it. maybe i’m too conformist and need to have the regularity of regular yarn? >Let it become what it wants to be. Middle of the road size needles would work for me on thick/thin yarns … As you saw the other day, Christine it isn’t past me to use very large needles with sport yarn even … the candy canes worked great!Happy knitting! >Try the Hip Hop Coat pattern by Ann Budd in the Winter 2005 Interweave Knits.